When working on large or even small projects, it is best practice to create a naming convention for everyone to follow. This will help keep the work organized and consistent. For improved consistency and ease of use, incorporate naming conventions for your scenes and other project elements. We recommend that you name your scene using alphanumeric characters: a to z, 0 to 9 and underscore ( _ ). Avoid capital letters or spaces in the file names. Try to provide the maximum amount of information for future identification, which helps ensure that you do not mix up elements and lose information. For example, you could name a scene adventure_sc001, adventure_scene_01, adventure_character_models or adventure_seq01_sc002. When you create drawing layers, it is recommended to name them instead of keeping the default name. This way, your work will be organized and it will be easier for another person to work with your data later on. This will avoid technical issues when working on different platforms such as Mac OS X or Linux. It is highly recommended that you incorporate a naming convention for the layers when building cut-out puppets. This will be very useful later on. 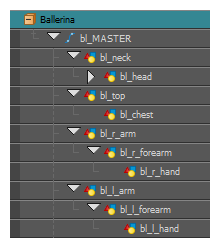 When you use a blank rigging template, all of the nodes’ names are generic. You will need to add naming information, such as the character’s name and the angle. Harmony provides you with a script called Add Prefix or Suffix that allows you to add a prefix or a suffix to a series of selected nodes at the same time. In the Network or Timeline view, select all of the nodes or press Ctrl + A (Windows/Linux) or ⌘ + A (Mac OS X). In the Scripting toolbar, click the Add Prefix or Suffix script button. The Add Prefix or Suffix dialog box opens. Select the Prefix or Suffix option, depending on what you want to add to the element’s name. Type the prefix or suffix information to be added to the node name. We recommend that you use a naming convention for your drawings. If you combine all of the angles of a character in the same breakdown scene, it is a good idea to identify each angle used. f1, f2, f3, s1, s2, etc.